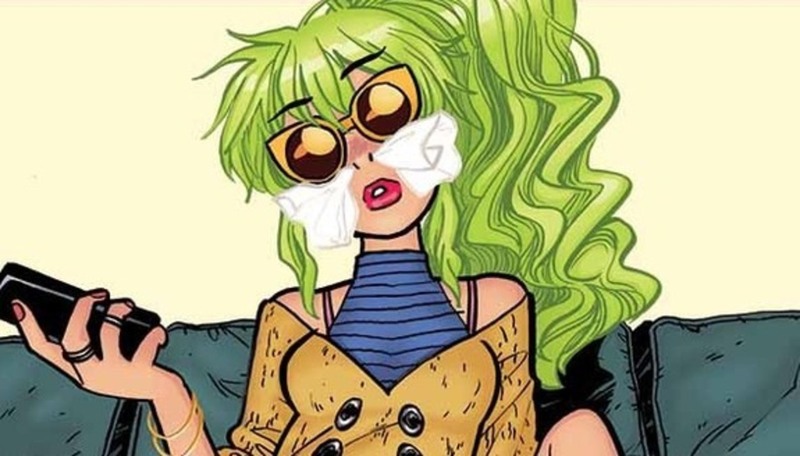 Bizarrely humorous and gorgeously illustrated, Snotgirl is a poppy and fluorescent-colored commentary on the difficulty of living up to the social media identities we create for ourselves. Co-created by Scott Pilgrim creator Brian Lee O’Malley and artist Leslie Hung, Snotgirl follows trend-setting fashion blogger Lottie Person. 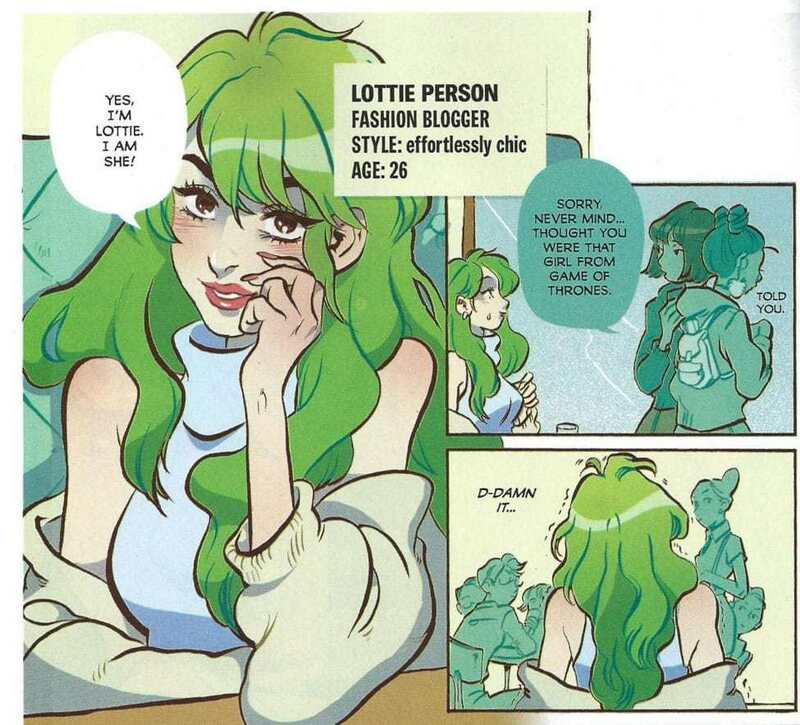 Tall, gorgeous, green-haired and on the cutting-edge of cosmetics and clothing, Lottie wants you and all her fans to know she’s living the most fabulous life ever. Underneath the shimmering and bubbly facade of her carefully curated digital existence, Lottie’s real life is rife with disappointments. She hasn’t gotten over her ex, who is now dating a younger but totally plain jane girl. Her social circle are of little help as they are as equally vacuous as she is. Worst of all, Lottie’s allergies have gone from bad to worse, leaving her a runny-eyed and mucousy mess. Struggling to maintain her glamorous social media persona while her personal life begins to crumble, things become more complicated when Lottie reacts badly to a new antihistamine which may have caused her to murder a new – and just as chic – acquaintance. ‘Snotgirl’ vol. 1 collects issues 1-5 of the ongoing series. Snotgirl is at its best when providing an often hilarious commentary on the idiocy of the social media identities many of us create for ourselves. You can’t help but snicker watching Lottie obsessing over taking the perfect selfie to show her adoring fans while, in reality, she’s crippled with existential dread and ruminating on the futileness of maintaining a blog. The supporting cast gives the book many of its smiles and laughs. Fashion intern Esther is clear headed and brings much needed common sense to Lottie’s world. Mystery girl Caroline has an air of danger to her, injecting the world of Snotgirl with a bit of intrigue and danger. The only real stumble in Snotgirl is when O’Malley and Hung introduce the mystery pharmaceutical drug subplot. As the story advances, it becomes clear this will play a big part in Lottie’s story, so some more information on the medicine and her new shady doctor would be welcomed greatly. Lottie is a unique protagonist in that she is so intensely unlikable. She assigns belittling nicknames to those around her which denote what character they are to play in the shallow movie that is her life. Lottie isn’t evil, she’s just incredibly self-absorbed, but pretty much so is everyone else in Snotgirl. O’Malley excels at this sort of you-can’t-help-but-love character. In many ways, Lottie is reminiscent of his most popular creation – Scott Pilgrim. Both are comedically self-centered and yet imbued with an irresistible charm. Time will tell if Lottie will overcome her narcissism long enough to become the hero of her own story like Scott Pilgrim did his, but at the very least, she’s a fascinating character to be inside the head of. The MVPs of Snotgirl is its art team. Hung is the find of the decade with her manga-influenced character work. Often her fashion-conscious characters are posed like pinup models, feeling perfectly at home in the style-obsessed world of Snotgirl. A lack of backgrounds in many panels isn’t a problem as Hung wisely understands where she excels best is the emotion she draws upon the faces of her characters. Colorist Micky Quinn has a ball utilizing the kinds of bright colors sorely seen in modern comic books. Effervescent and with a personality of its own, Quinn’s coloring adds greater depth and emotion to Hung’s line work. Letterer Maré Odomo earns his paycheck by making typography fans everywhere drool. It’s dizzying the amount of typefaces Odomo uses in Snotgirl. Whether evoking the fonts seen in fashion magazines and blogs, or mimicking a typewriter, Odomo is head and shoulders above his peers. While its story may not always make perfect sense, Snotgirl will have you examining its many pages and panels to admire its aesthetics. Towards the end of Green Hair Don’t Care, it becomes clear Lottie’s downward spiral is going to further descend before it has any chance of getting better. 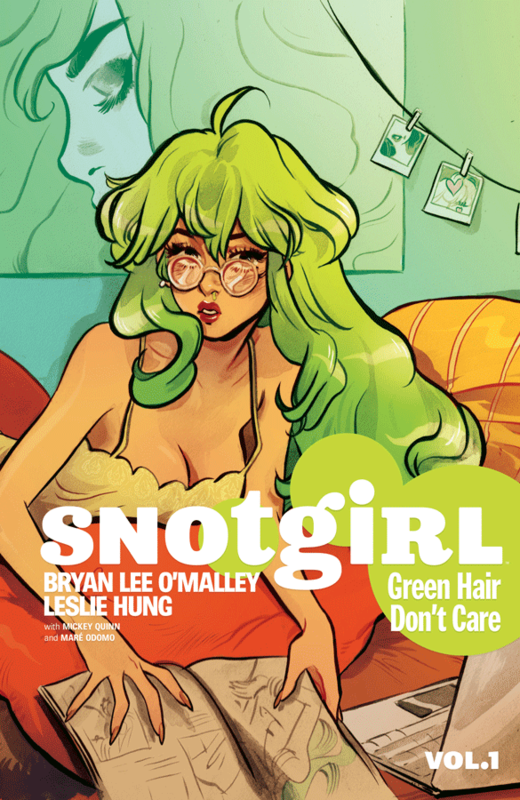 As a vain police detective who is enthralled with Lottie enters the picture, and as Lottie seemingly imperils another life while on she’s on her new and mysterious allergy medication, Snotgirl is a comic to watch when it returns this July. This entry was posted in Bryan Lee O/Malley, Comic book review, Comic books, Image Comics, Leslie Hung, Scott Pilgrim, Snotgirl, Trade paperback and tagged Brian Lee O'Malley, Image Comics, Leslie Hung, Scott Pilgrim, Snotgirl, Snotgirl comic book, Snotgirl Image Comics by Michael B. Murphy. Bookmark the permalink.